When it comes to dinner in PJ, hawker food or 大炒 would be the first thing that comes to our minds. 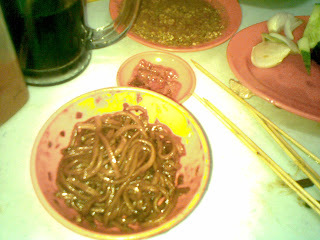 Me & my unimates Ming, hy, Teng & Jonny decided to have our dinner at Ah Hua Hokkien Mee located at Paramount Gardens PJ. Upon reaching the place we were very very lucky to be able to find a parking space...2 blocks down the road! As my boss brought me here for supper some months ago I instantly recognized the place. 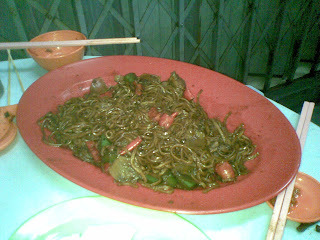 One of the first dishes to arrive is the fried noodles. The smell was like...i can't find the words to describe it...simply divine!! Theres just something about cooking with charcoals thats just so darn irresistible. Accompanied with their sambal 3 big plates of noodles disappeared within 15minutes!!! 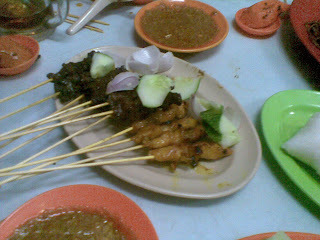 Next to arrive are the satays. 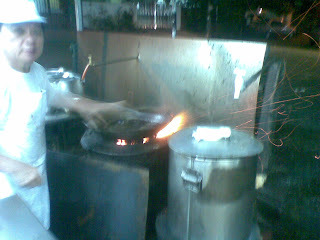 They serve my favorite lamb satays here so I wasnt complaining at all. Everyone totally agreed that the lamb was awesome! The chicken was succulent and juicy as well, just the way they should be. The beef however was on the rough side. We have a hard time finishing the beef satays. Last to come was the fried lala. Apparently the boss could not find where we were seated -_-'" but he was so nice that he offered to prepared us a fresh dish!wow thats a first! normally what I usually get at best is getting the boss to heat up my food. When it arrived we simply knew that it was definately worth the wait. It definately taste so much better that it looks, and it dosent look half that bad at all! 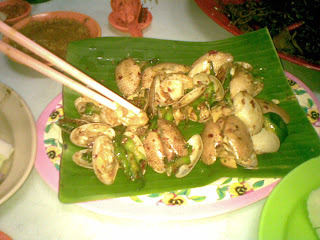 They were FRESH, juicy and simply gorgeous...the sambal sauce was just heavenly. And the best thing is that they were BIG...just look at the picture! All of the food: 3 big plates of fried noodles, 2 bowls of steamed soup (not that good, therefore I didnt post), 1 fried lala,30 sticks of satay and half a dozen of drinks for RM80...economical no? 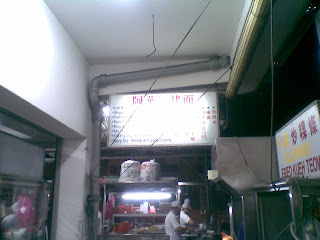 First locate the stall lol, Ah Hua 阿华 hokkien noodles. If you are not blind you'll definately find it. And if you are blind...simply follow the smell!!! 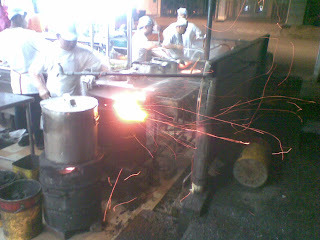 Food was soooooo good that i actually smell like the hawker stall...not a good idea when you are going off to meet some hot chicks...but oh well...for food this good i guess its worth it! 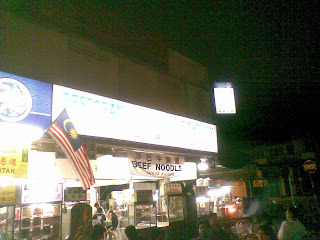 Doggyjames says...if you like hawker food, and if you LOVE hokkien noodles, what are you waiting for??? wow! thanks!! will go check this place out. i love hokkien noodles!! yummy!! =D look forward to more yummy places from you. thanks thanks!! So you like to waste food eh...?